What is the difference between the expiration and renewal date? What is the difference between ‘Charging the card’ and ‘Billing the account’? The following is an overview of how auto-renew domains are charged, billed, and renewed at DreamHost. This is the date the domain name officially expires. For all domains, it is one day before a full calendar year from when you originally purchased the domain. You can view this date by visiting the Registrations page, or running a WHOIS query and looking for the 'Expiration date' line item. This date is different depending on if your domain is a general domain (such as .com) or a specific 'Auto-Renew Only' domain (see below). General domains — The credit card is charged, the account billed, and domain is renewed 31 days prior to the expiration date. 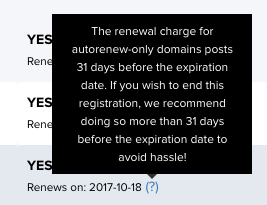 'Auto-Renew Only' domains — The credit card is charged and account is still billed 31 days prior to the expiration date, however the renewal date is different: the renewal date is the same as the expiration date. The ‘Charge date’ is the date your credit card is charged for the domain renewal. ‘Bill account’ is the date your DreamHost panel posts the charge that is due. Billing the account only posts the information to your DreamHost panel—it does not actually attempt to charge the credit card at all. New domain registrations and domains transferred to DreamHost are automatically defaulted to 'auto-renew'. You can adjust this setting by visiting your panel using the following instructions. You can set a regular domain to auto-renew on the Registrations page. When you set it to auto-renew, the option is set to 'YES'. The auto-renew setting is found on the Registrations page. The "Auto-renew by" or "Delete by" deadline is listed on the Registrations page, directly beside the expiration date. To renew an 'Auto-Renew Only' domain correctly, the domain's auto-renew setting must be enabled prior to the “Auto-renew by” or "Delete by" date found in the panel. If the domain is not auto-renewed on the expiration date as described below, it goes into a redemption period during which it can usually be recovered for an additional fee. Please review the following article for details on how regular domains are charged and billed. Please review the following article for details on how auto-renew domains are charged and billed.